Welcome to the last of our ‘Spotlight on…’ blog series! 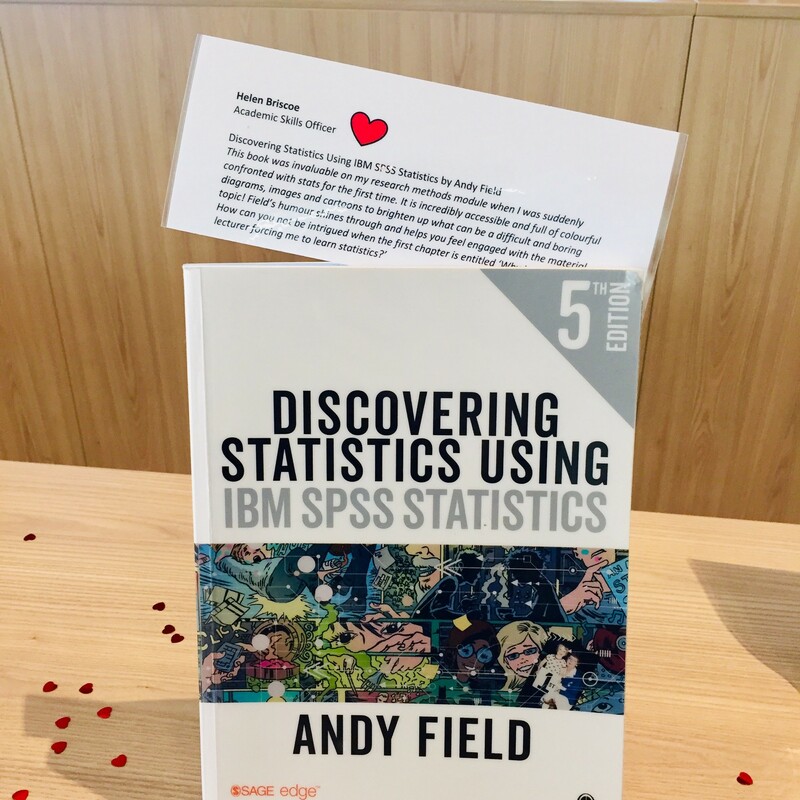 As part of #LoveYourLibrary month, our Student Advisors have been bringing light to some of Catalyst’s lesser-known fantastic features. If you’re struggling with finding academic help resources within Catalyst, then look no further. 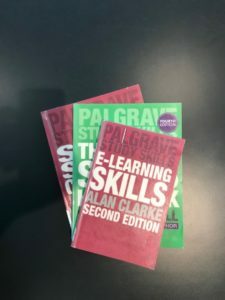 Here, I’ve compiled a list of Palgrave Macmillan Study Skills handbooks that will enhance your study skills. 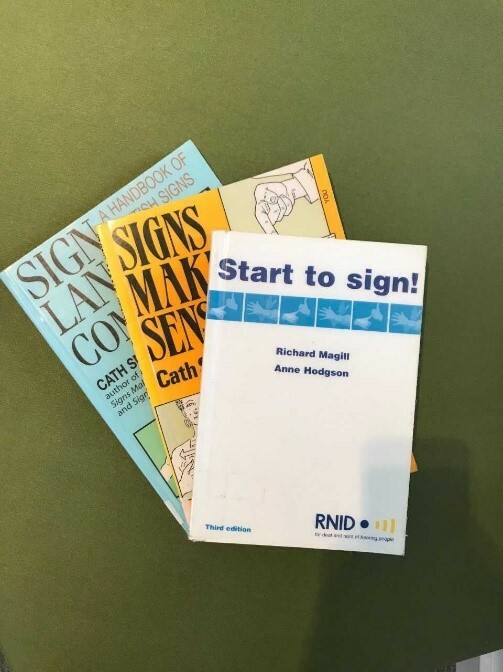 Not only does Catalyst have these useful books available, you can also book onto any of the Learning Services workshops or one-to-ones. There are multiple workshops available, including Academic Writing, Paraphrasing, Presentations and Lit Reviews. You can book onto any of these workshops here. There are much more resources for study skills available in Catalyst, why not use the library catalogue to check some of these out? 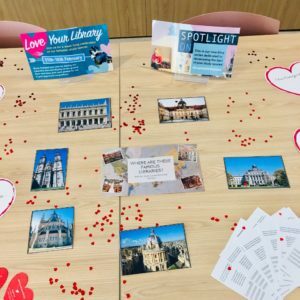 Welcome to our seventh ‘Spotlight on…’ blog series! As part of #LoveYourLibrary month, our Student Advisors have been bringing light to some of Catalyst’s lesser-known fantastic features. Looking for books can be frustrating, especially when you finally find the one you want and realise all copies are out on loan. But have no fear because a cool thing about our library is the fact that we can reserve books! What makes it even better is that after you reserve a book all you have to do is sit back and relax because not only will they email you once the book is available…but they’ll even leave it for you to collect right next to the self-issue machines. 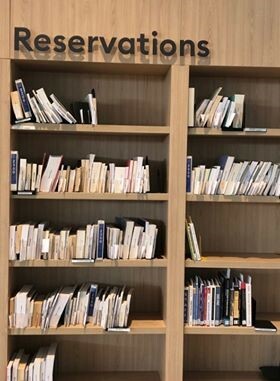 All you have to do is simply go to the Reservations shelves on the ground floor of Catalyst, find your student number (they are all filed in numerical order) and your book will be waiting. You do not even need to go through the hassle of finding the book on the library shelves, they do all that for you. 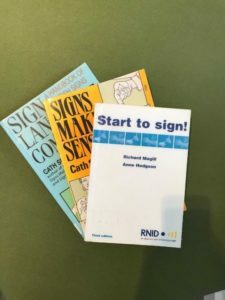 Just make sure you take a few steps to the left to self-issue the book and you are good to go! 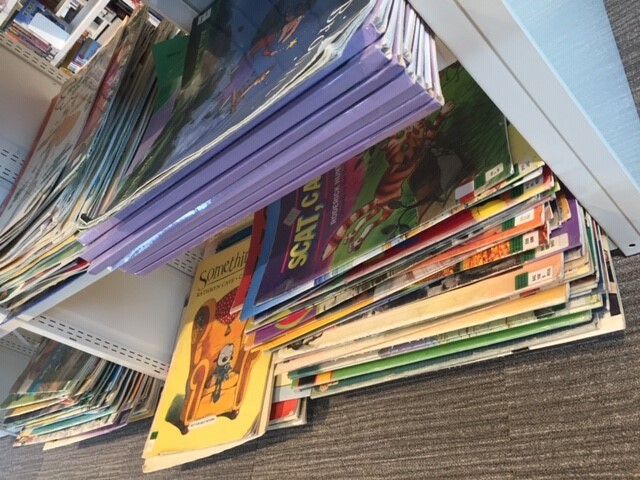 Did you also know that if the library does not stock a particular book at your home site, they may have it at one of the others and you can reserve it. 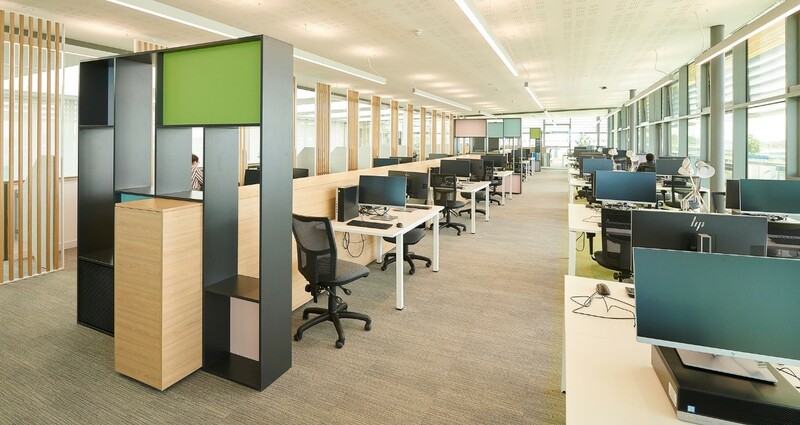 There are three libraries in total; Aintree, Manchester and our main in Catalyst at Ormskirk. TOP TIP: Aintree also has a great fiction selection for any avid readers out there! All libraries are open to use so if you happen to be visiting Manchester or Aintree, or they are closer to home for you, then you can collect and return books there too – which is one of the great things I love about our library, it makes book borrowing easy! Location and opening hours of all libraries can be found on our webpages! Welcome to the sixth of our ‘Spotlight on…’ blog series! 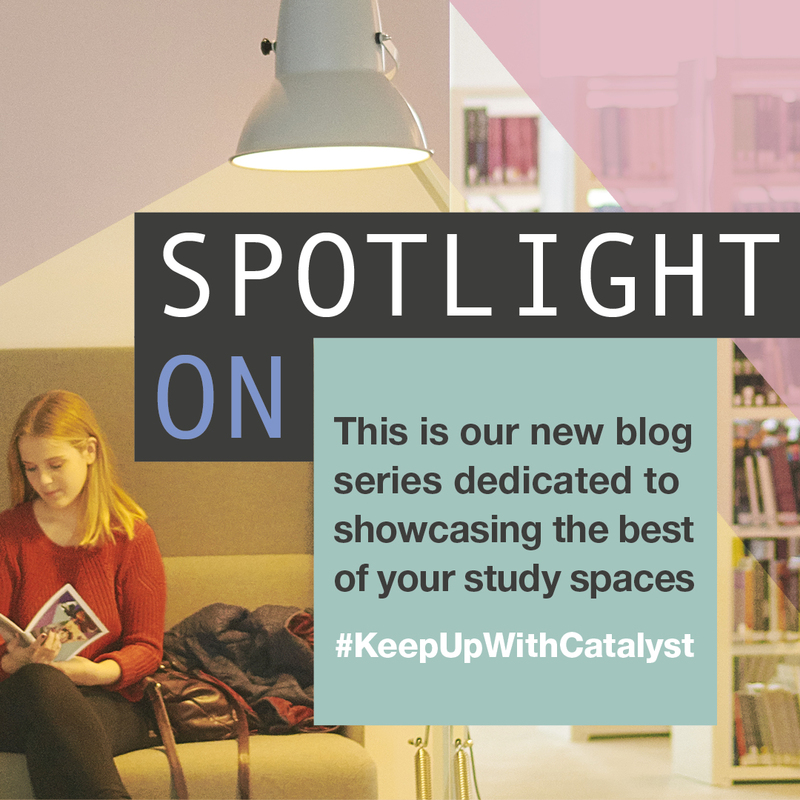 As part of #LoveYourLibrary month, our Student Advisors will be bringing light to some of Catalyst’s lesser-known fantastic features. Have you taken in the incredible views from the floor-to-ceiling windows? 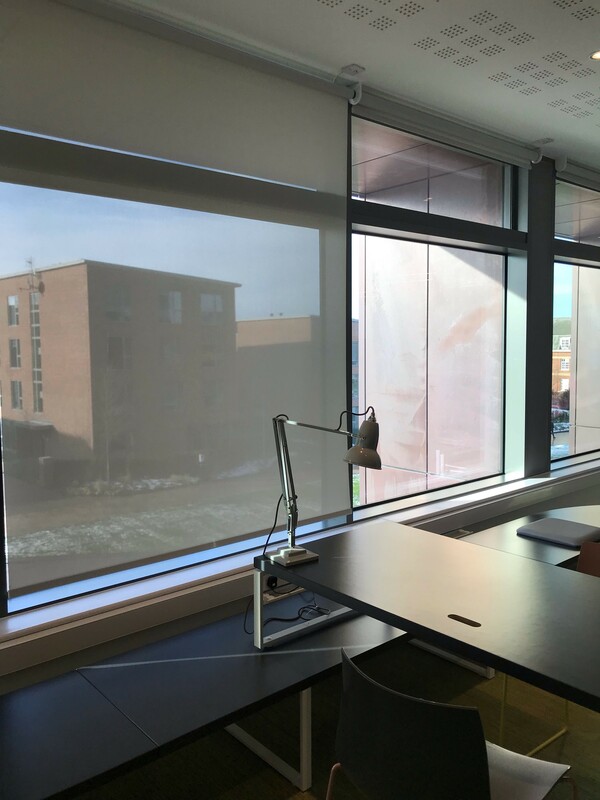 This allows for students to take a glimpse of their surroundings and enjoy the sights of our beautiful campus, Lancashire and beyond. Perfect for when you need that quick study break! Did you know… silence benefits brain chemistry improving your learning and remembering ability. 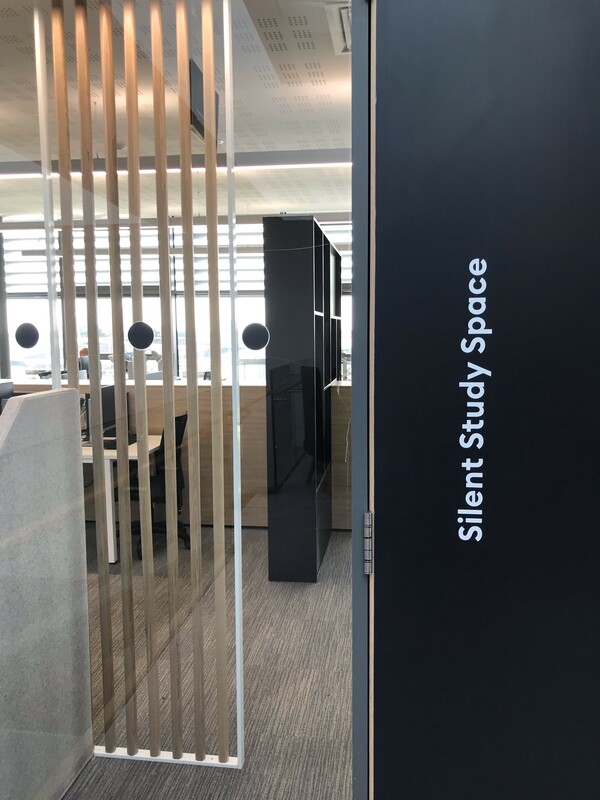 When it comes to that all-important study pause, just outside of the Silent Study space you will find an array of comfortable furniture where you can regroup with friends or simply grab a bite to eat from the vending machine. Did you know… silence decreases stress by lowering blood cortisol levels and adrenaline. 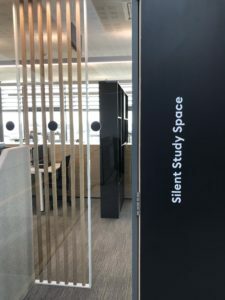 One of the best features of the Silent Study space is that it caters for individual study preferences. There are computers that are available to use by all students, either on a singular desk or next to another computer. 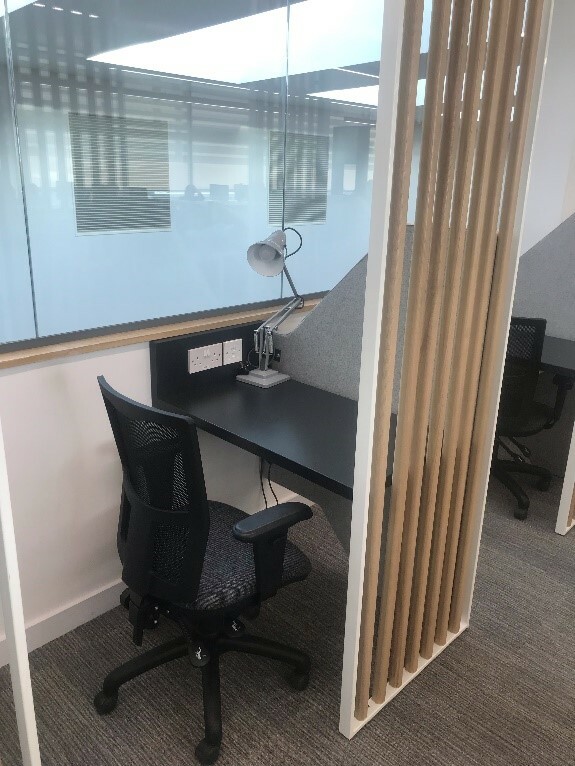 As well as this, individual study spaces are available where students can use their own laptop. 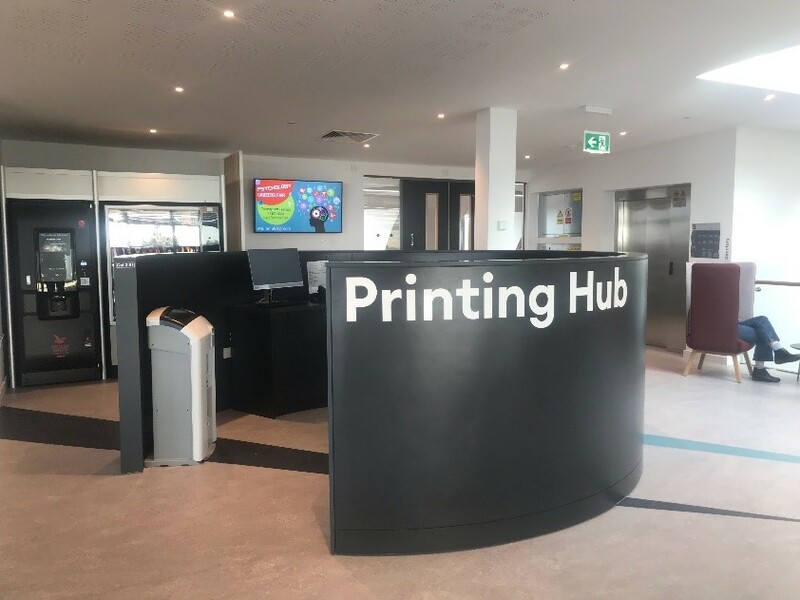 The printing hub for the Silent Study space is located on the third floor right outside the study area, resulting in quick and easy access to printing and scanning any work you may have. There is also a rover phone located here which means you can contact the helpdesk from the third floor if you require any assistance. 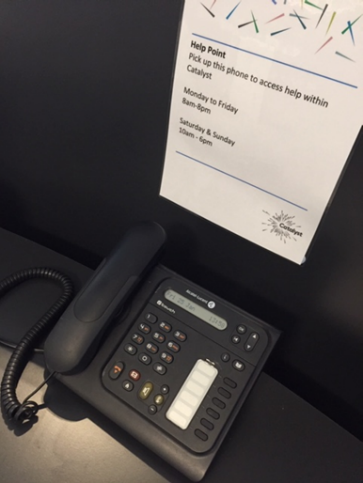 You just have to pick up the phone and it will automatically connect you through to the helpdesk. Welcome to the fifth of our ‘Spotlight on…’ blog series! 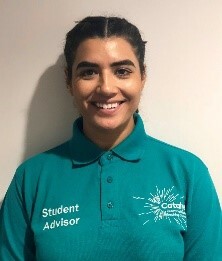 As part of #LoveYourLibrary month, our Student Advisors will be bringing light to some of Catalyst’s lesser-known fantastic features. Attention music lovers! If you’d much rather listen to music played from your CD player than your phone then look no further. 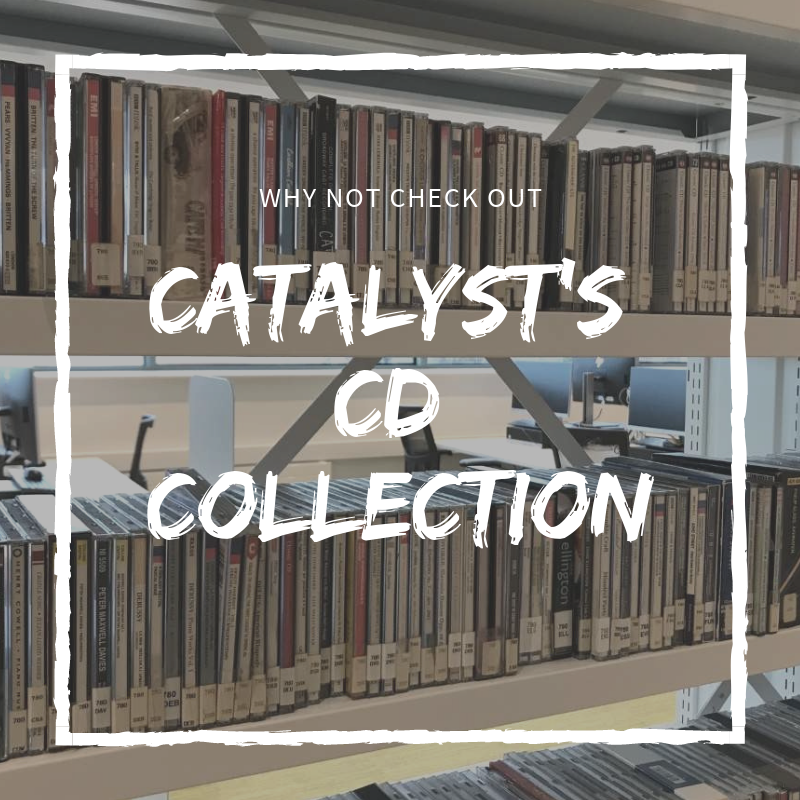 Edge Hill offers an array of CD choices in Catalyst, many of which you are eligible to loan! The CD collection is located on the 2nd floor of Catalyst. If you’re a lover of the classics, Beethoven might be the best choice for you. Or, if you prefer mellow music, Bob Marley’s tunes could be your choice. For band lovers there is a collection for The Beatles and their greatest hits. And for the lovers of musicals, there are multiple; CATS, Fun Home, Oliver and many more are available for you to loan and listen to. There are many more artists to be discovered in the music collection! Why not check it out yourself and find your favourite genre? Welcome to the fourth of our ‘Spotlight on…’ blog series! As part of #LoveYourLibrary month, our Student Advisors will be bringing light to some of Catalyst’s lesser-known fantastic features. 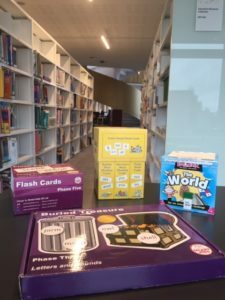 In today’s post, Jade explores Catalyst’s selection of educational resources. Did you know we house more than just books and journals? Edge Hill College opened in Liverpool in 1885 as the first non-denominational teacher training college for women. 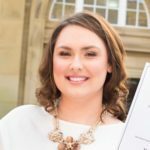 From its roots as a specialist establishment with 41 female trainee teachers, Edge Hill University now has over 10,000 full-time students and has been at the forefront of initial teacher training for 130 years. The primary education teaching degrees combine expert tuition and a significant amount of time spent in schools gaining hands on experience. So, considering all the to-be teachers here on campus, we have complied some facts about our Educational Resources Collection. 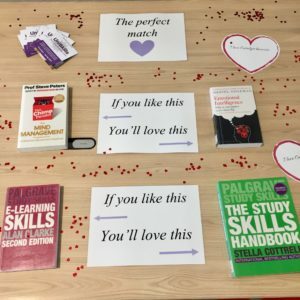 We hope you’re inspired to use them on your placement! Where are the resources located? What can the resources be used for? If you are interested in the resources but are unsure which of them would suit you, I recommend booking out one of the group rooms on the ground floor to check them out with your peers. By sampling and getting to know the resources better, you can avoid any surprises in the classroom and teach with confidence! See how to book your group room here. 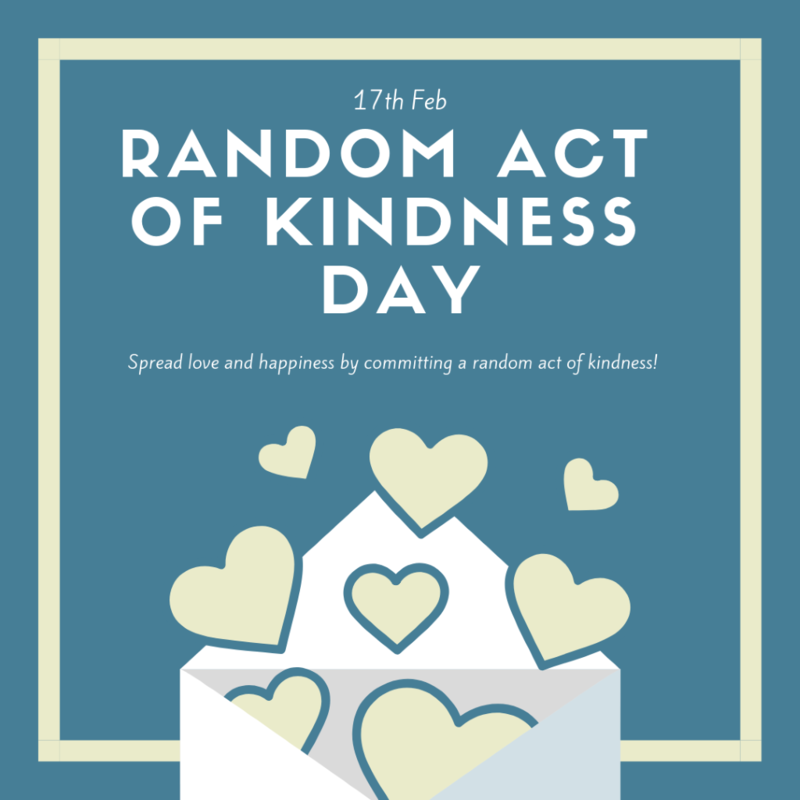 Today, 17th February, is Random Act of Kindness day. Research has proven that showing kindness and consideration to others has multiple benefits for both giver and receiver. Being kind increases oxytocin, which strengthens the heart and cardiovascular system, and produces endorphins, which are our natural painkillers. Kindness is contagious, showing kindness produces a ripple through its recipients, leaving more than just one person happy. Pay it backward and buy coffee at 53.3 Degrees for the person standing behind you in line. Send positive text messages to people you love throughout the day. Show them how much they mean to you. Let someone purchase their shopping before you if they only have a few items. Suggest a book recommendation using Edge Hill’s Library Services. Brighten your family member’s morning by leaving a kind or funny message on your mirror with a whiteboard marker. Help someone loan a book at the Catalyst. Practice self-help and self-kindness by spending some time today doing something you love. Leave a generous tip for a helpful and kind server. One for the year; on Mother’s Day and Father’s Day think of those friends who have lost a parent and check in with them. Those will be tough days. Why not join a bone marrow registry? Having yourself on the registry could be the difference between life or death for someone who needs bone marrow or stem cells. Anthony Nolan are a great charity that focus on finding stem cells and bone marrow for patients in need. Listen – don’t interrupt. Sometimes people just want someone to listen, not suggest a solution. If you’ve had great experiences from a business you like, why not write them a review online? These help a lot more than you realise. When you’re discouraged by your own voice, tell yourself something positive. You deserve kindness too! 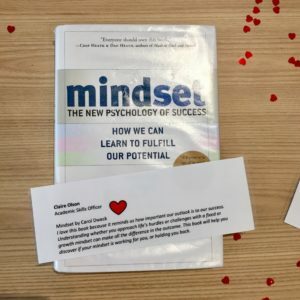 The Random Acts of Kindness Organisation showcases different ways that you can exhibit kindness and offers resources to promote a kinder and more thoughtful world. Why not become a RAKtivist? RAKtivists are ambassadors of the Random Acts of kindness Organisation that share their knowledge and lead by example. Make sure that, at least today, you offer kindness to those around you – strangers, family, colleagues, friends. People benefit from your generosity more than you can know. 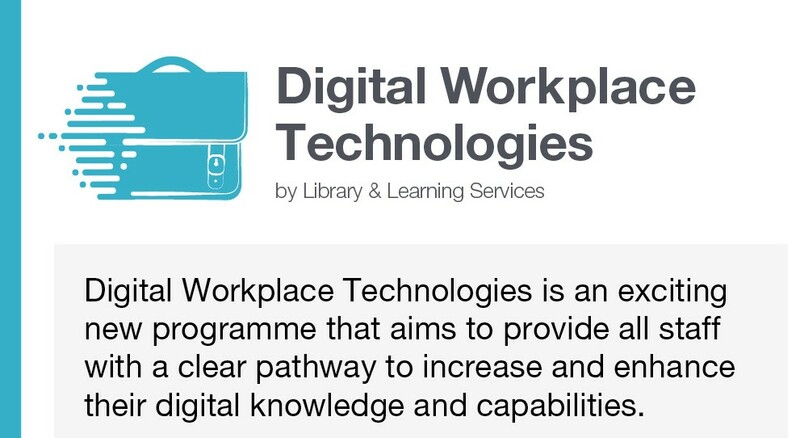 Digital Workplace Technologies is an exciting new programme that aims to provide all staff with a clear pathway to increase and enhance their digital knowledge and capabilities. 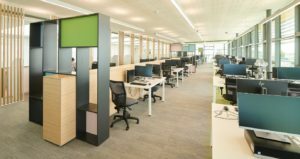 This year the current Digital Workplace Technologies offer has been restructured and refreshed in order to provide staff with a high level of training, support and online resources to support them on their digital journey. Our commitment is to improve staff digital capabilities and to develop our staff into digitally proficient learners and thinkers. Our vision is that staff will become digitally enabled professionals who are digitally competent and feel confident sharing their knowledge and expertise with others. Depending on your job role and personal interests staff can choose to explore numerous pathways to further develop their digital skills. These pathways have been specifically designed to allow staff to enhance their knowledge in that area in more depth. Alongside face-to-face sessions, there will also be online guides, videos and links to useful LinkedIn Learning courses that will allow staff to be independent learners. We hope that our supportive and forward-thinking offer will encourage staff to get actively involved in the sessions/guides and that they will be eager to follow the digital pathways. Stay up-to-date with our latest developments on our blog and staff WIKI. Catalyst is a particularly pleasant place at the moment – cheery help desk staff, students smiling at one another, it’s as though the whole building is enveloped in a bubble of loveliness! We can’t quite put our finger on it, but we think it might be something to do with national #LoveYourLibrary month. If you hadn’t noticed, since the start of February we’ve had a little digital celebration of all things Library. 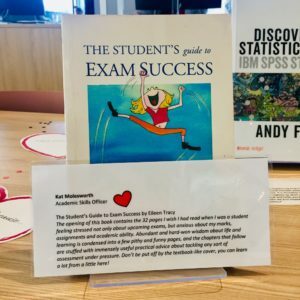 While our ‘Spotlight On…’ blog series has been showcasing lesser-known facts about your favourite study space, this week we will be going all in with special Student Advisor-led workshops, social media competitions and more. The first way to get your name in the pot for this year’s most coveted competition is to visit the event desk space and have a go at guessing the location of our list of famous libraries. Do you know your Bodleian from your St Marks? Are you search savvy enough on Google to find out? You also don’t want to miss our #LoveYourLibrary month book recommendations display. 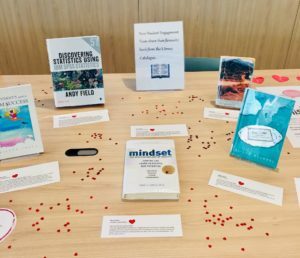 Not only have the Student Engagement Team been busy reviewing their top-picks from our very own Library Catalogue, but they’ve also paired some books they think go together better than Edge and Hill. We apologise in advance for inspiring you to use up all your book allowance! This hands-on session will show you everything you need to know about navigating our online tab. Whether you need to download the referencing guide or access subject specific journals, your Advisors will be on hand to answer or signpost any of your burning questions. So don’t hold back, there’s plenty of ways to get involved with #LoveYourLibrary month and show Catalyst how much you care. Only EHU Students are eligible to win prizes, EHU staff may enter but are not eligible to win a prize. 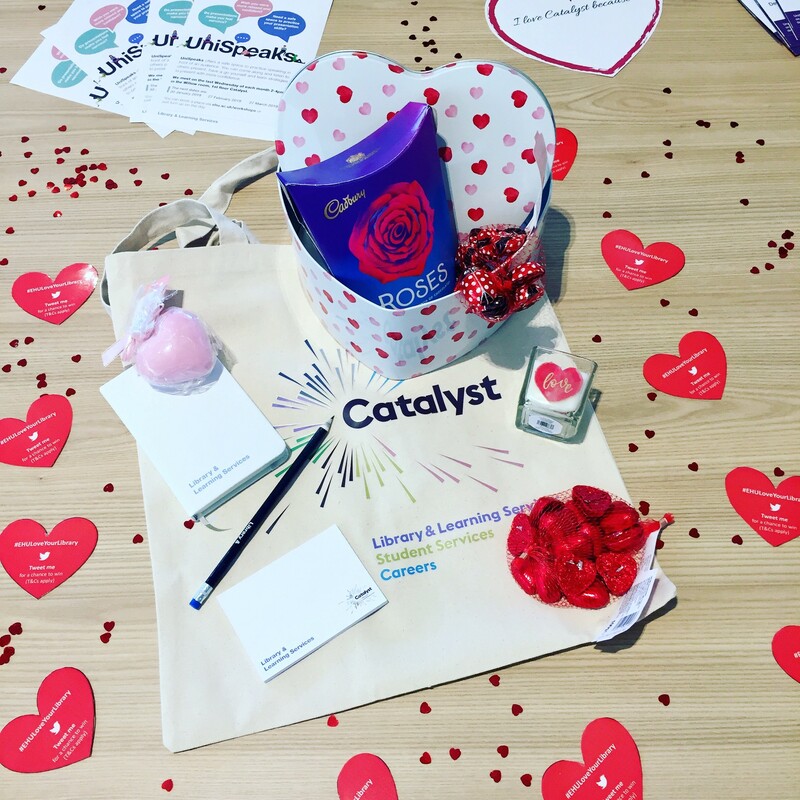 To collect your goody bag for entering you will need to bring evidence of your competition entry to Catalyst Help Desk and quote ‘UniSkills competition’. 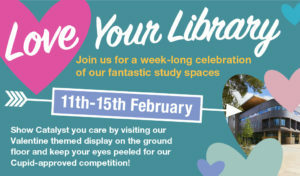 Twitter competition entries must contain the hashtag #EHULoveYourLibrary with the heart(s) visible in the image. The prize will be given to the owner of the Tweet or student number on the ‘Famous Libraries’ competition slip. You may tweet as many times as you wish to share your heart, but only one entry (per method of entering) will be entered into the final prize draw. The winner will be contacted through their Twitter or student email account. The winners will be picked at random from a prize draw on Tuesday 19th February 2018. All winners must be able to collect the prize from Catalyst Help Desk and be able to provide evidence/ID that they have won before we can hand over the prize. Prizes must be collected by 5pm on Tuesday 26thFebruary 2019. If anyone cannot be contacted or prizes are not collected by Tuesday 26th February the entry will become null and void and a re-draw will take place. Welcome to the third of our ‘Spotlight on…’ blog series! 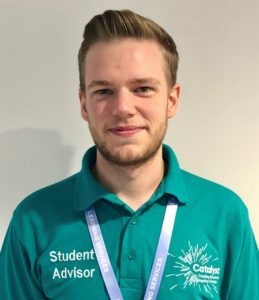 As part of #LoveYourLibrary month, our Student Advisors will be bringing light to some of Catalyst’s lesser-known fantastic features. Catalyst is a large building and when in need, trying to track down the exact person you need can be timely. 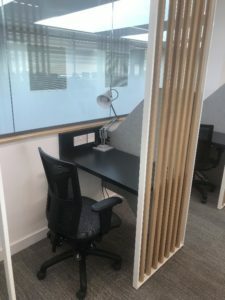 While the help desk is a great place to go with any query you might have, this blog shines light on the other services available designed to minimize disruption to your precious study time. These phones are located within the printing hub on each floor and are free for students to use. To use this phone, you just pick it up and it will ring the Catalyst Helpdesk for you. You may wish to report an issue with the printer, such as it having jammed or run out of paper. These phones can also be used to report any noise concerns. Did you know that students have control over the blinds in Catalyst? You can request for a blind to be lowered or heightened by texting +44 (0)1613 751608. 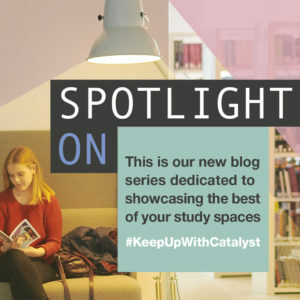 There may be times in Catalyst where the noise in your study area becomes too loud. You can inform members of staff about the noise without leaving your study space by texting +44 (0)1613 751608. Simply include your location in the text and a member of staff will deal with the issue. 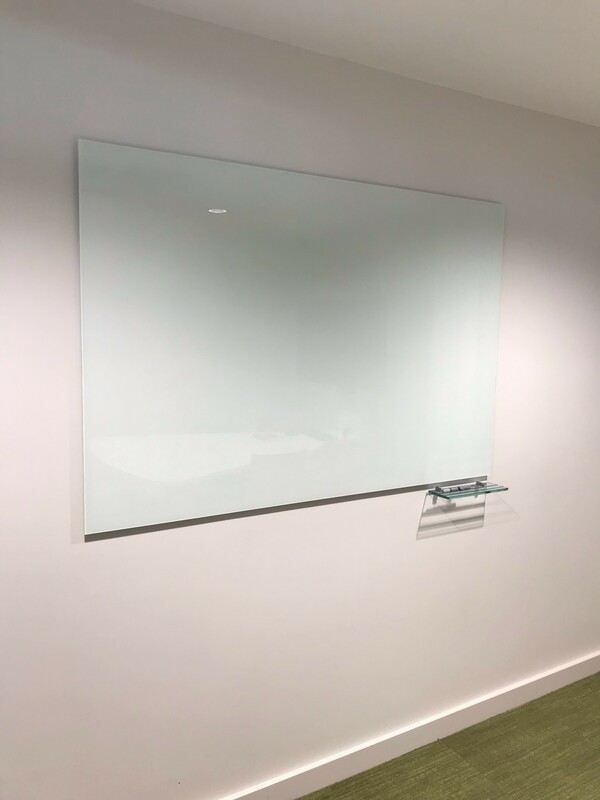 There are wipe boards and pens in the study rooms located on the ground floor that students are welcome to use (provided they book the room in advance). If there aren’t any wipe board pens in your study room, the help desk staff will happily provide you with some. 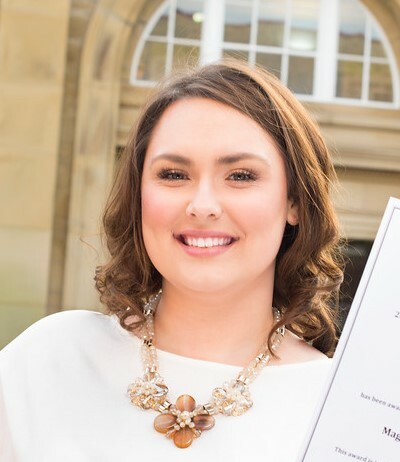 Welcome to the second of our ‘Spotlight on…’ blog series! 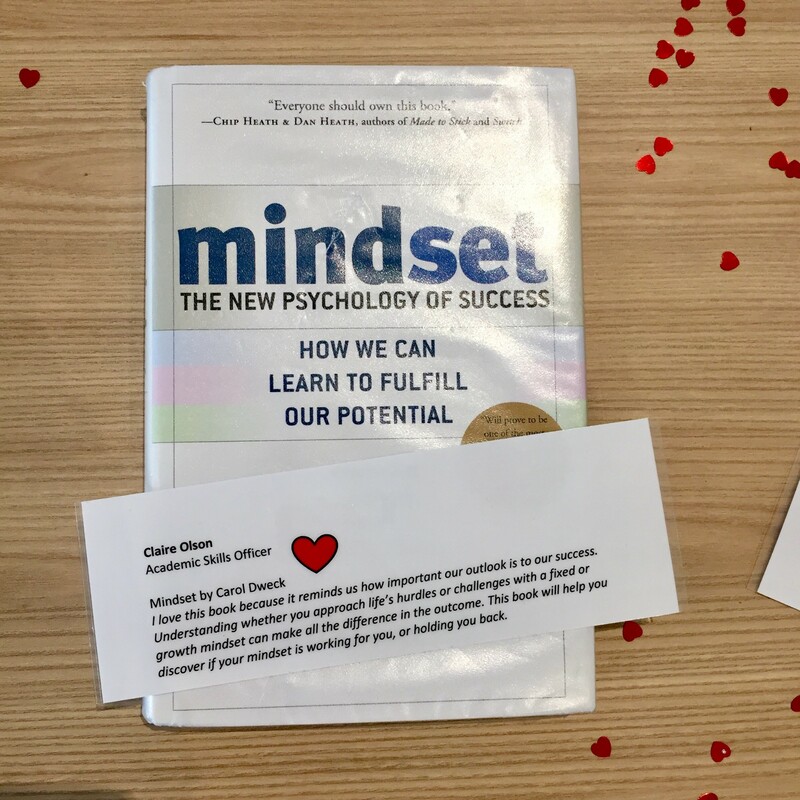 As part of #LoveYourLibrary month, our Student Advisors will be bringing light to some of Catalyst’s lesser-known fantastic features. 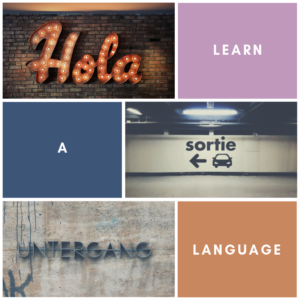 Learning a language has an exciting array of benefits. 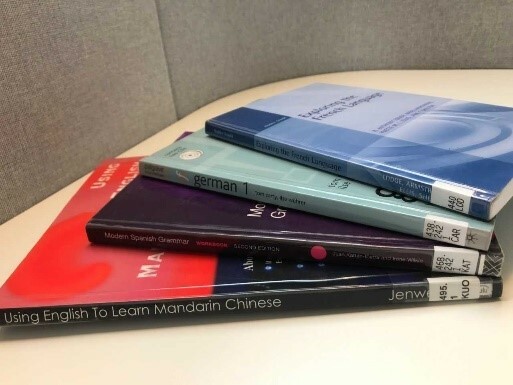 So why not enhance your memory, improve your first language, benefit your academic performance and even widen your career choices with a multilingual library pick? 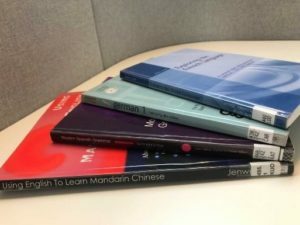 Fortunately, Catalyst has lots of foreign language resources you can delve into as a starting point. 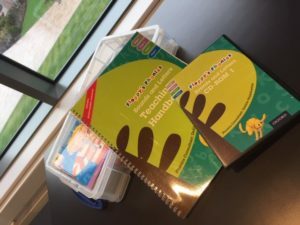 Whether you’re beginning from scratch or are already a seasoned Spanish speaker, browse the library’s inspiring collection of both grammar and teach-yourself exercise books. There’s no excuses! With so many languages to choose from, half the fun may even be in discovering a tongue you didn’t know existed!